Each day, we went on a canoe ride and did some hiking. Here is a video of one of the canoe rides. 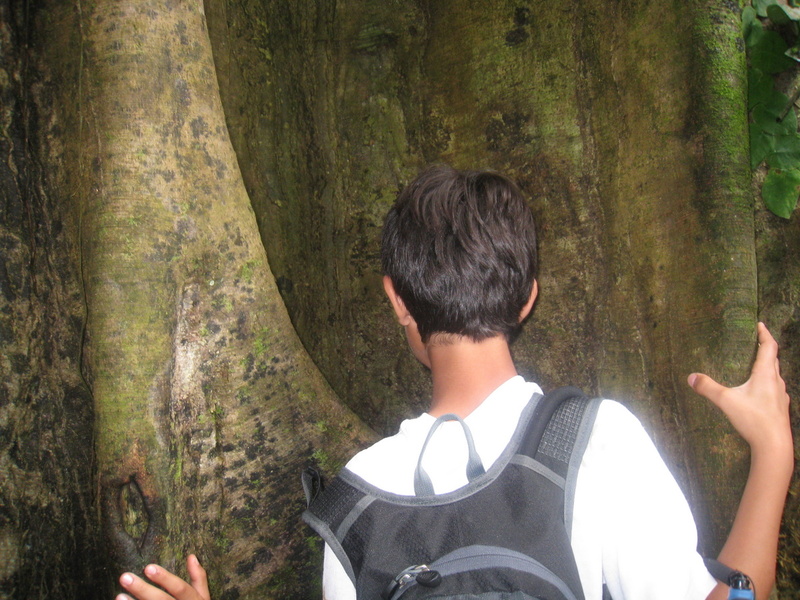 Listen to the sounds of the jungle and see the amazing variety of plant and animal life. 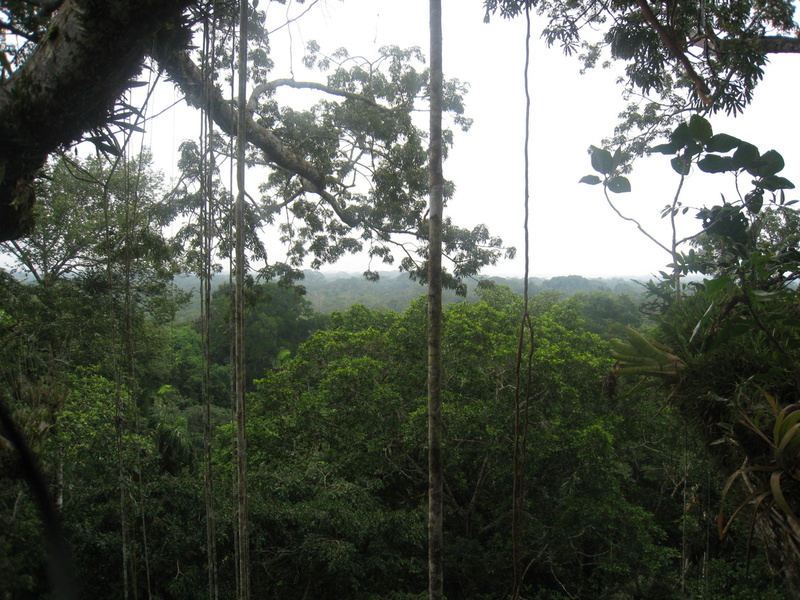 On one of the days, we climbed up to the top of a 135 foot (40 meter) kapok tree and viewing platform. 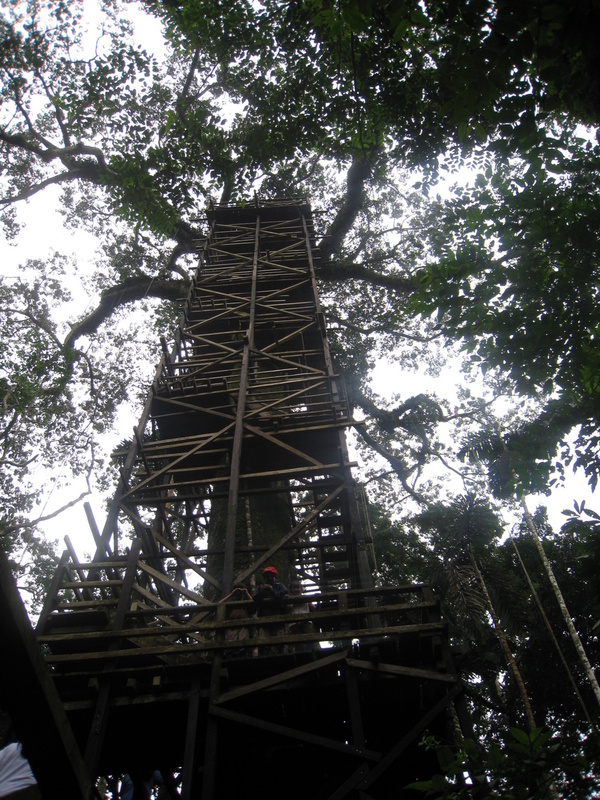 It sits just above the rainforest canopy and provides the opportunity to view the birds and monkeys from a different vantage point. Here are the boys looking thru the telescope at the birds. 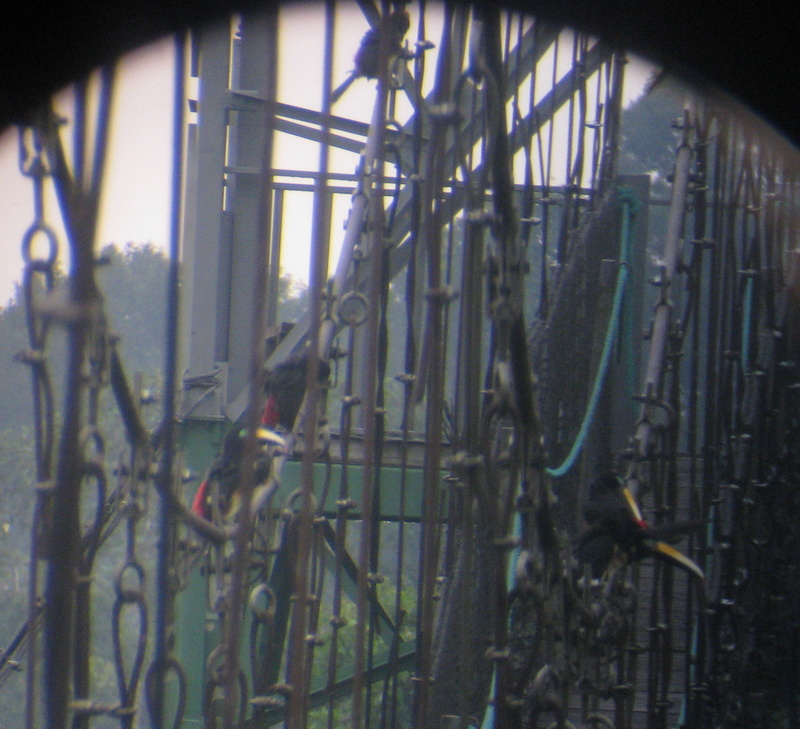 Here is a picture Nikhil took of a toucan thru the telescope. The next day, we went to the top of a 90 foot (30 meter) suspension bridge. Here is a video of the walk across the bridge. 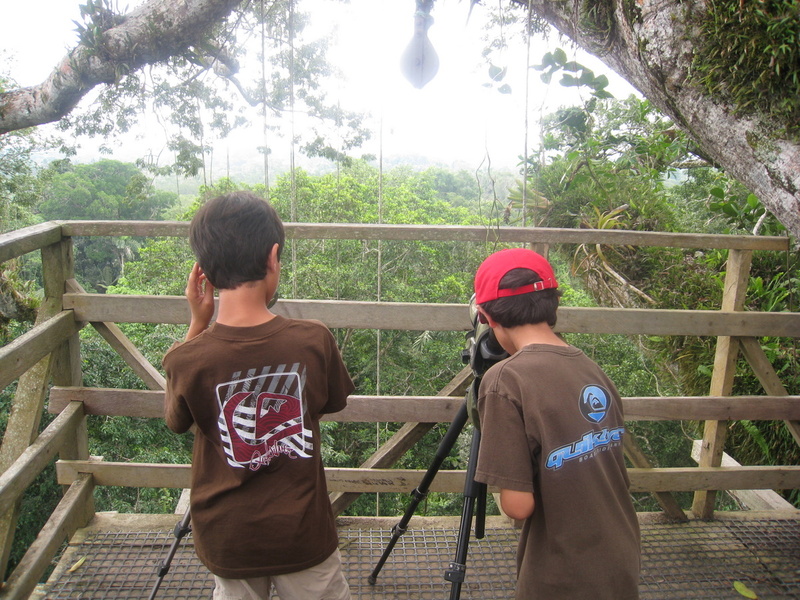 At the top, we saw more toucans just sitting on the bridge. Six in all. Here is a picture from back down at the bottom, looking up at the suspension bridge. It looks scarier than it is. 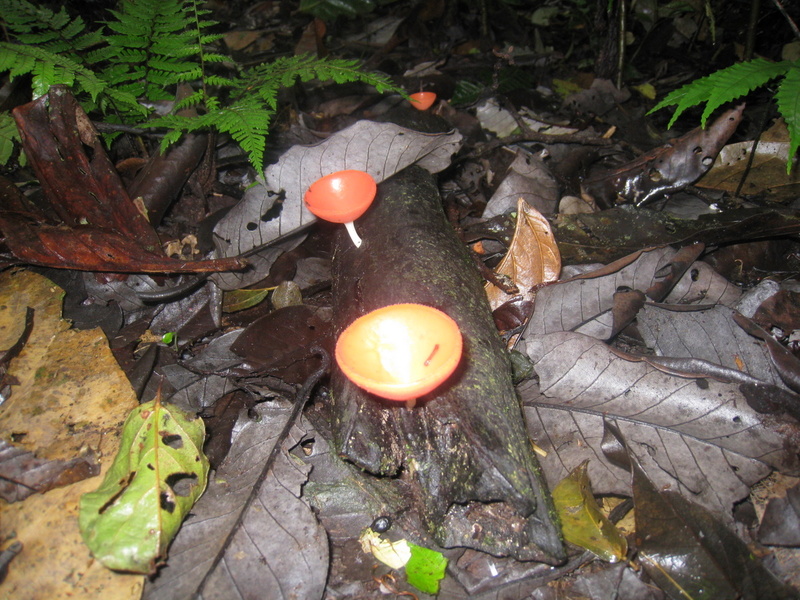 Ont the way back to the lodge, we saw a fungus called a champagne cup. Here is a school of squirrel monkeys. They traveled in packs. If you look closely, you can see 3 of them. We saw several of them up close and personal. And here is me and my better half taking a break. On the ride back to the lodge, we were surprised by a fast approaching thunder and lightning storm. We made it safely back to the lodge and enjoyed another wonderful meal. 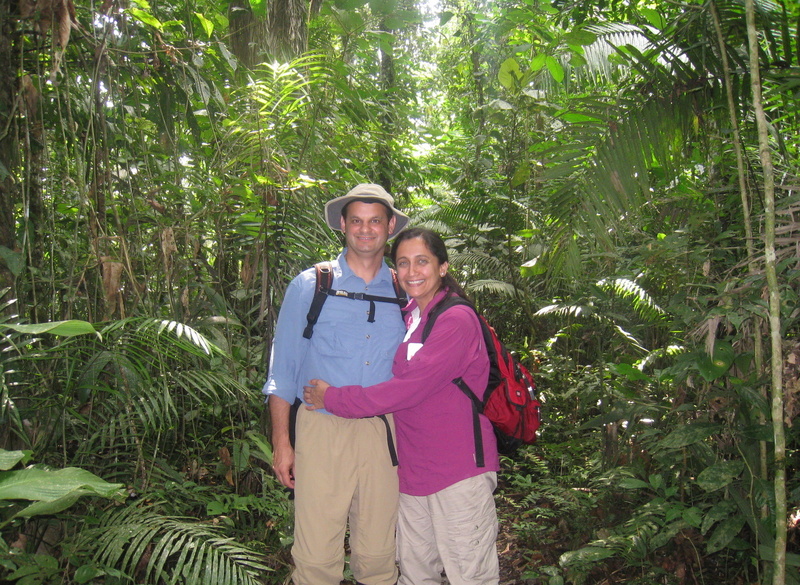 The Amazon is a truly awesome experience and Sacha Lodge was a great place to see all that it has to offer. 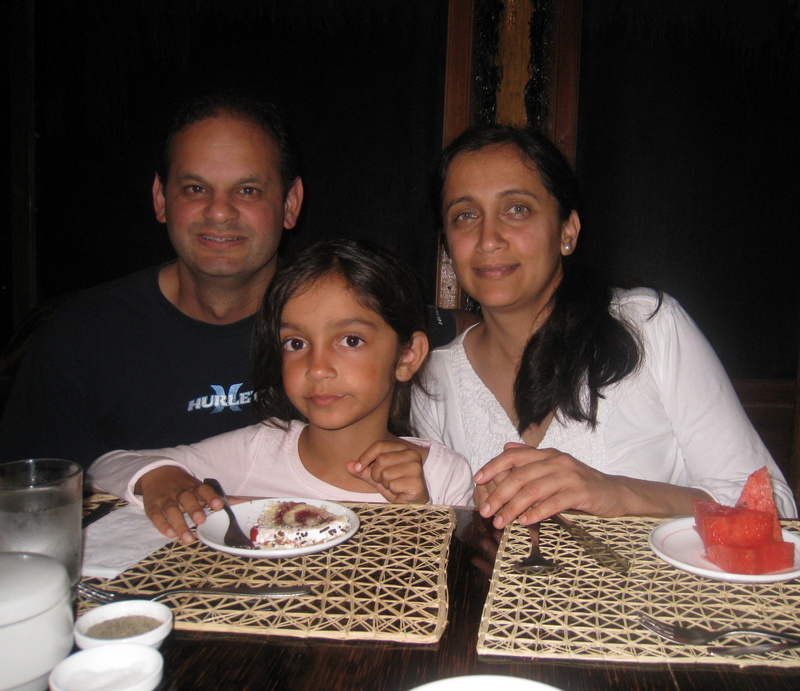 I still have a couple more posts of the equator trip and a trip we took to a volcano in Banos. Stay tuned! All of our hikes and tours were led by 2 guides. 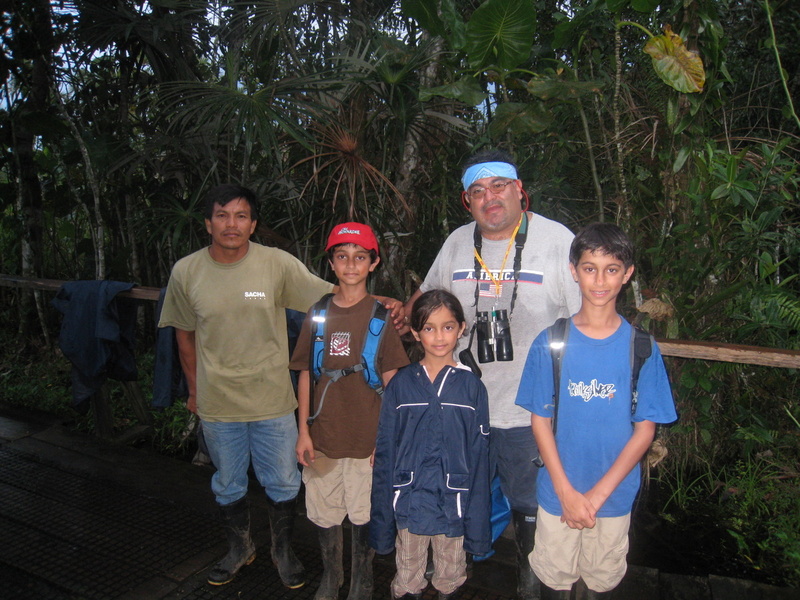 One was a native Indian guide (on the left below – named Segundo) and the other was a high school professor by training that acted as translator and story teller (named Oscar). The kids really took a liking to Segundo. Even though he spoke no English, he showed them special jungle trees, birds and bugs and cleared the path for them on all our hikes with his super machette. 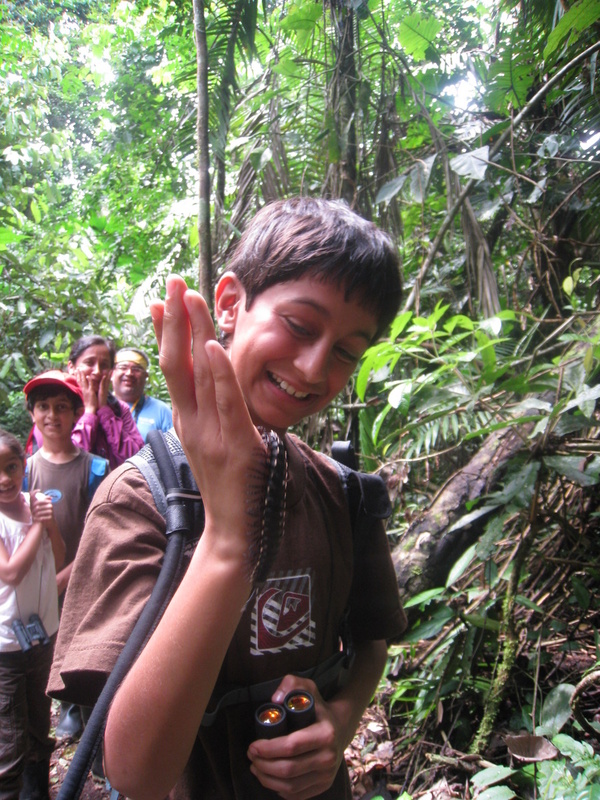 Here is Vikram with a millipede on his hand. 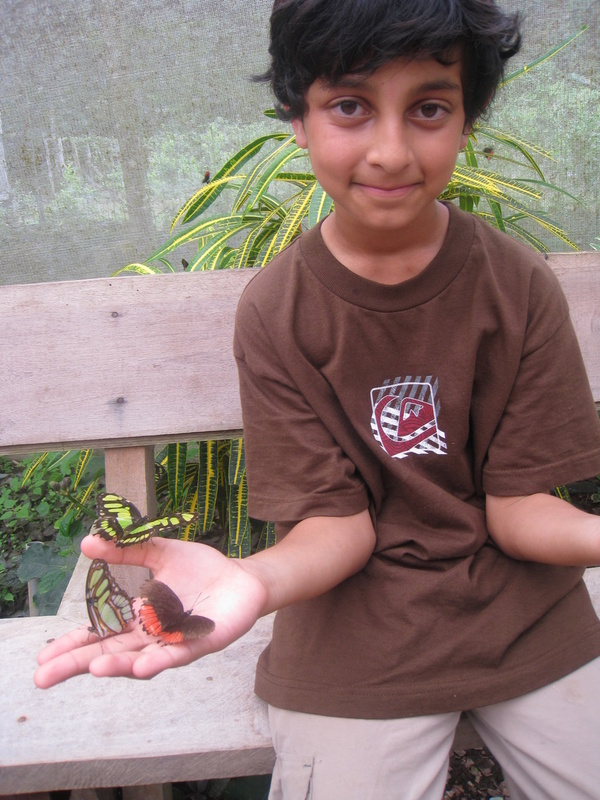 Here is Nikhil with some of the butterflies that seemed to be attracted to him. 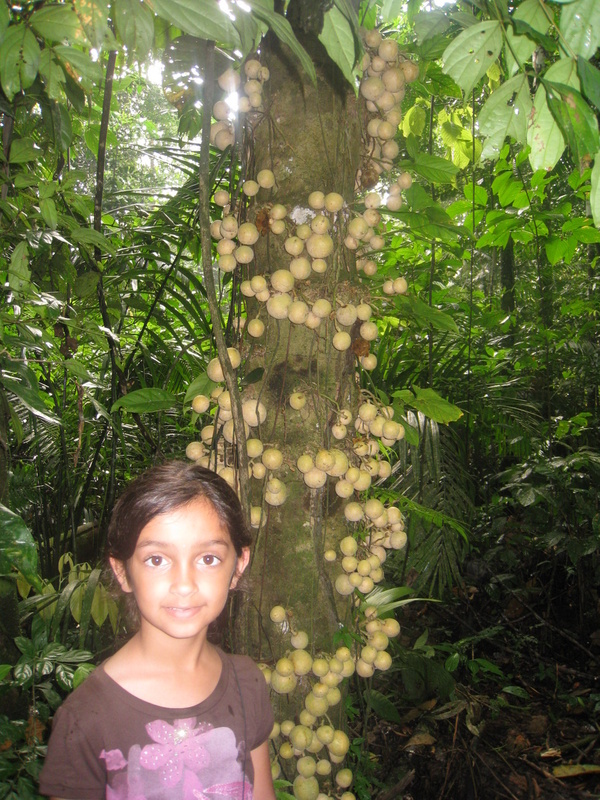 And here is Annika by the nut trees. 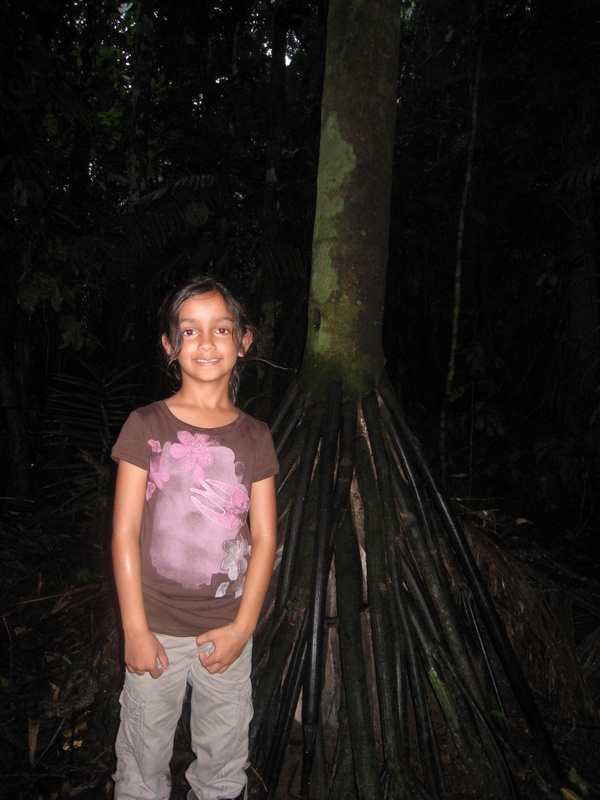 Here is Annika in front of one of the millions of odd looking trees. 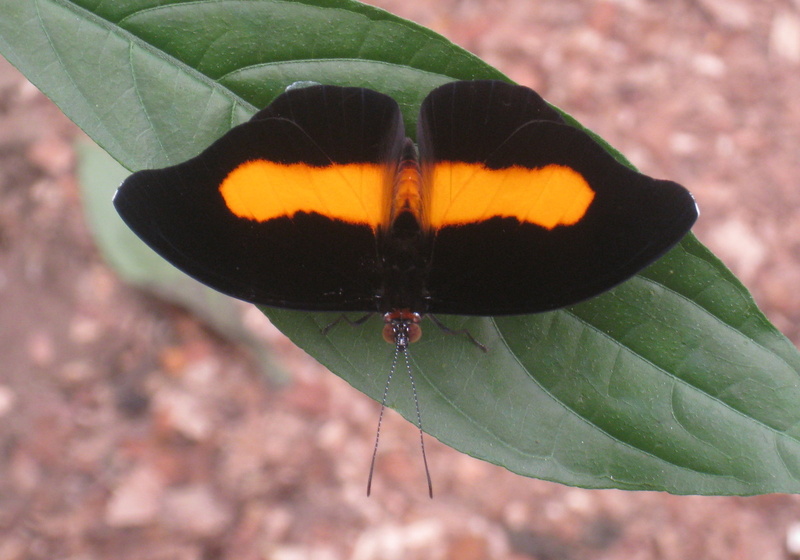 It is said that 10 acres of Amazon jungle have more species of wildlife than the entire United States. 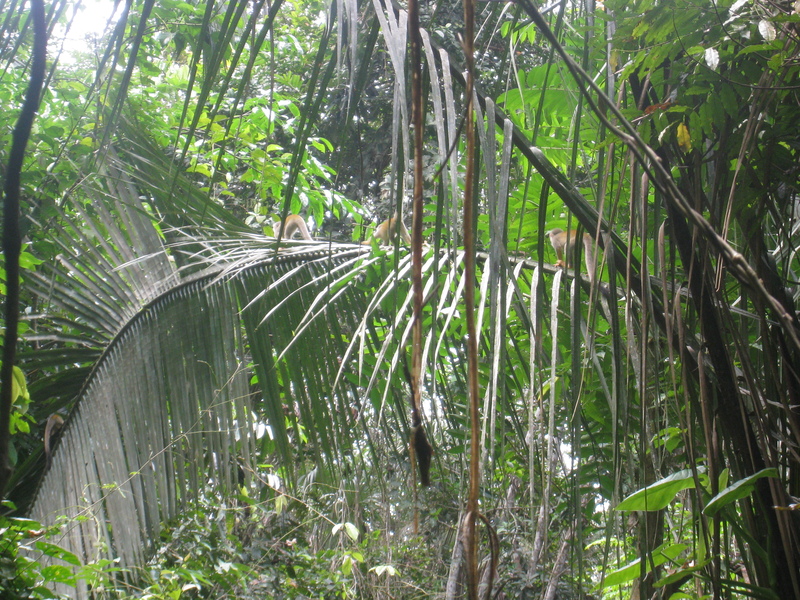 This picture is in the middle of the day, but because the jungle is so dense it seems almost dark and requires the use of a flash. One of the kids’ favorite trees was Sangre de Drago or dragon’s blood tree. When pierced by a knife, the tree oozes a red sap that is medicinal in it properties and is said to treat everything from cuts and bites to cancer. It is one of the magical herbs in the jungle. 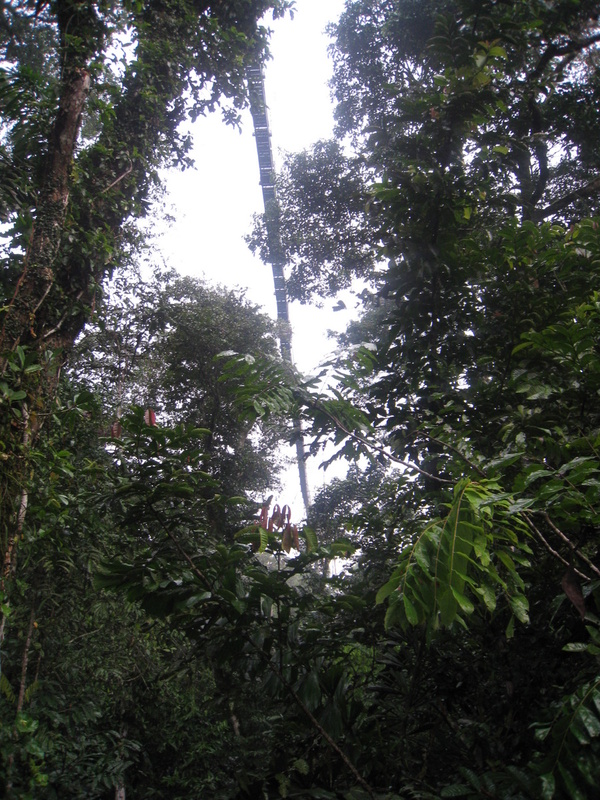 Our guide also showed us the trees used to make everything from pitocin (from the cecropia tree), jungle viagra, the rubber plant (used to make chewing gum), jungle peanuts, and all kinds of magic mushrooms. Here is Vikram looking inside a bat hole. 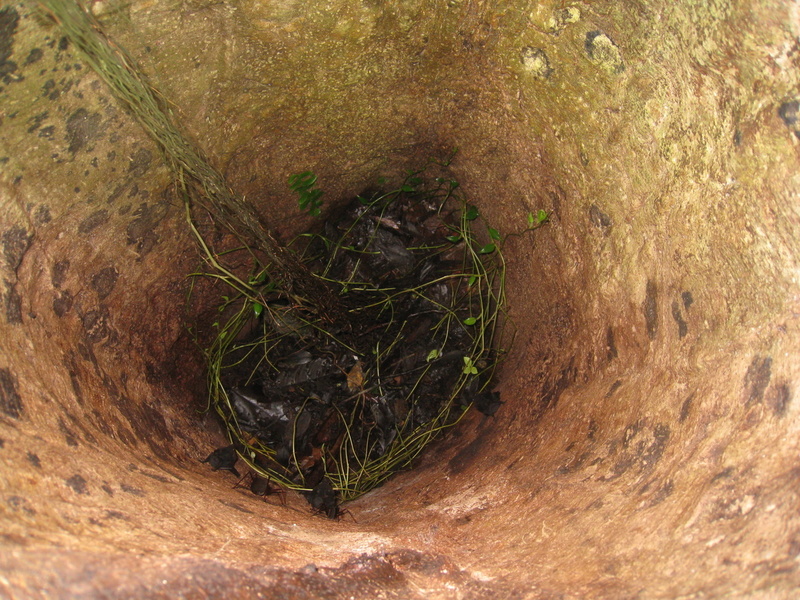 The bats are hiding inside the tree trunk (this picture again uses a flash). One of the evenings, we did a night-time canoe ride and saw (and felt) whole flocks of bats flying around. 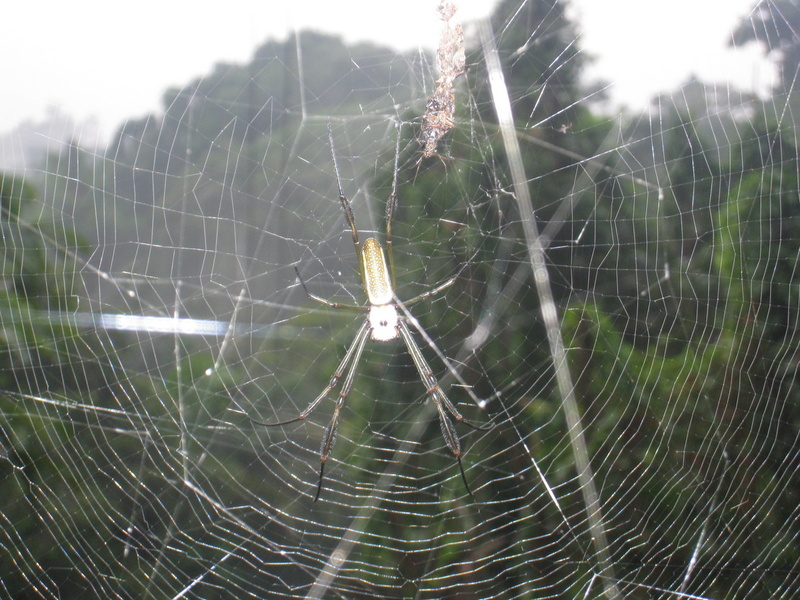 One of the hundreds of unique spiders. Here is a picture of a termite nest. 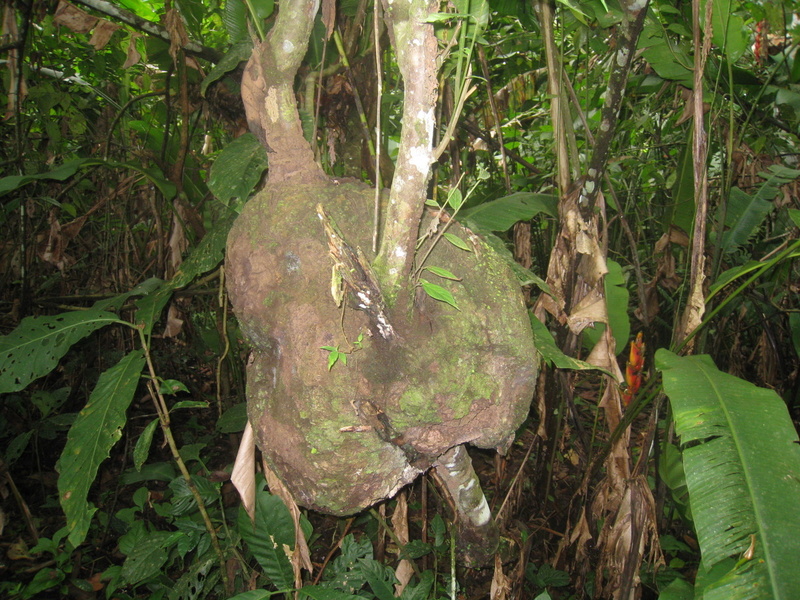 There were thousands of these huge nests along the trails. 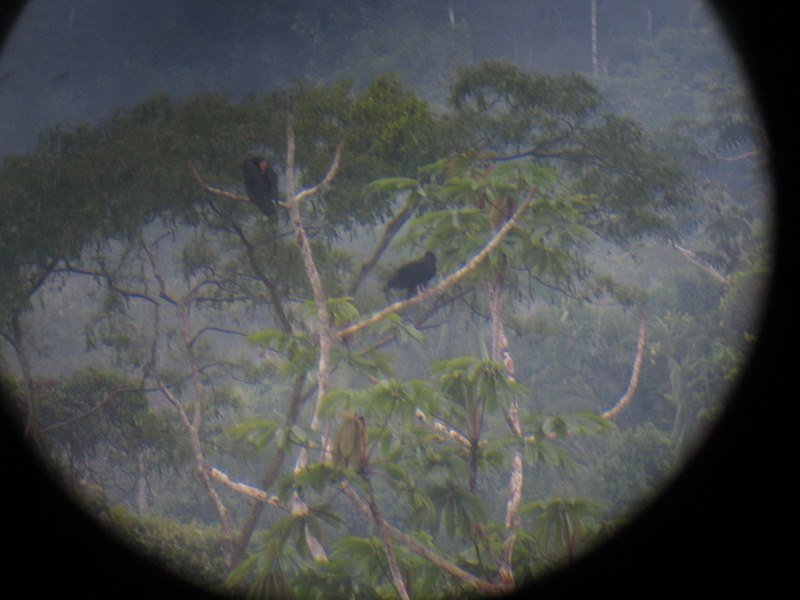 Here is a picture of a couple of vultures hanging out at the top of a tree. 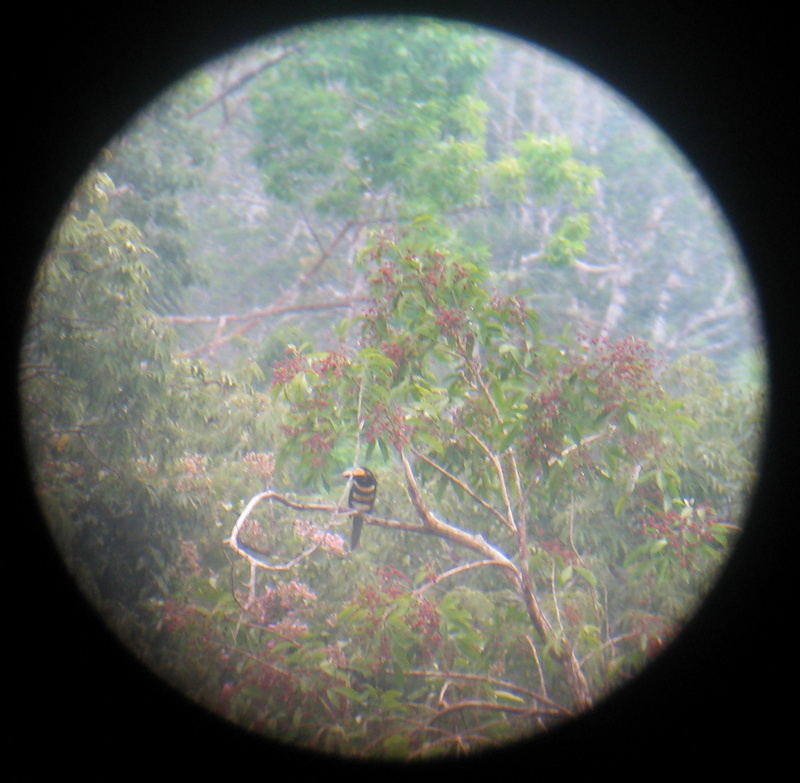 We saw so many birds that the guides pointed out including euphonias, macaws, toucans, herons, crested owls, tanagers, woodpeckers, hawks and hummingbirds. We also saw many different types of monkeys including the tiny pygmy marmoset, night monkey, squirrel monkeys, capuchins and howler monkeys. The monkeys were particularly fun to watch as they traveled in packs and were extremely loud and disruptive. 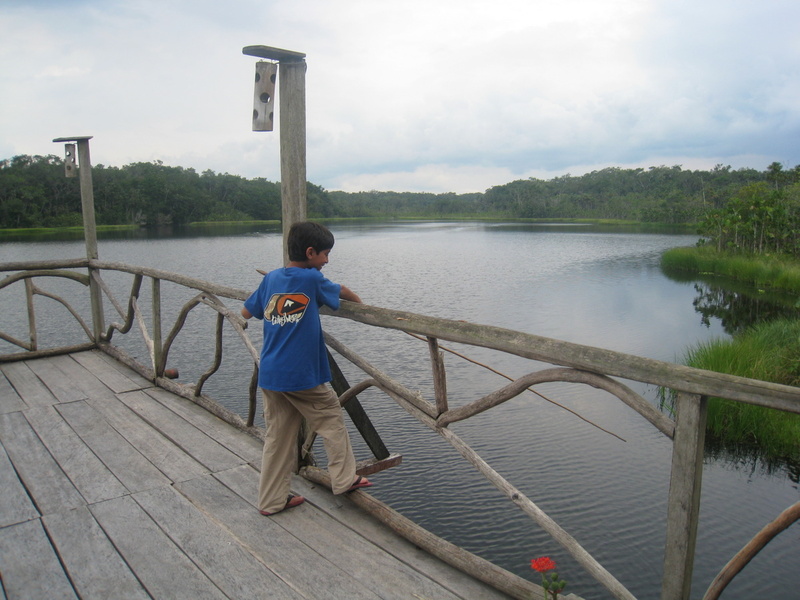 One of the afternoons, the boys went fishing in the lake for live piranha. They were extremely aggressive and devoured the bait as soon as it went in the water. Our Indian guide with lots of skill caught one and showed off the piranha’s razor sharp teeth. There were dozens of these red bellied and white bellied piranhas swimming in the lake. The boys then went swimming in the same lake! 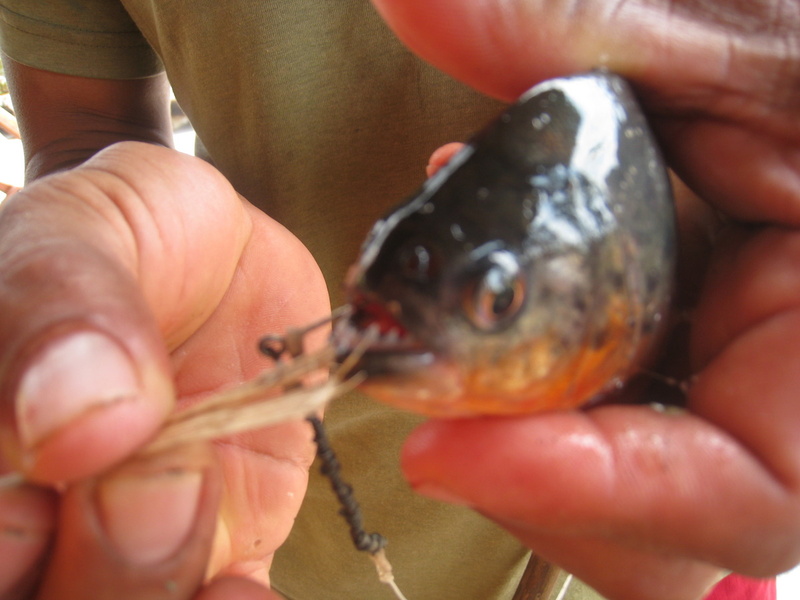 It is said that although the piranha are vicious, they only attack if there are open wounds and they can smell blood. In the same lake at night, we saw a caiman. Again, the guide said they only come out at night. In fact, the last evening we were there, there was a group of kids still swimming at the dock and the guide ushered them to come out of the water. I will add one more post with some additional videos and pictures from the suspension bridge and the tree house in the kapok tree. These were some of the best features of the lodge. I’ve been meaning to post a few more pictures from our last day in Paris. 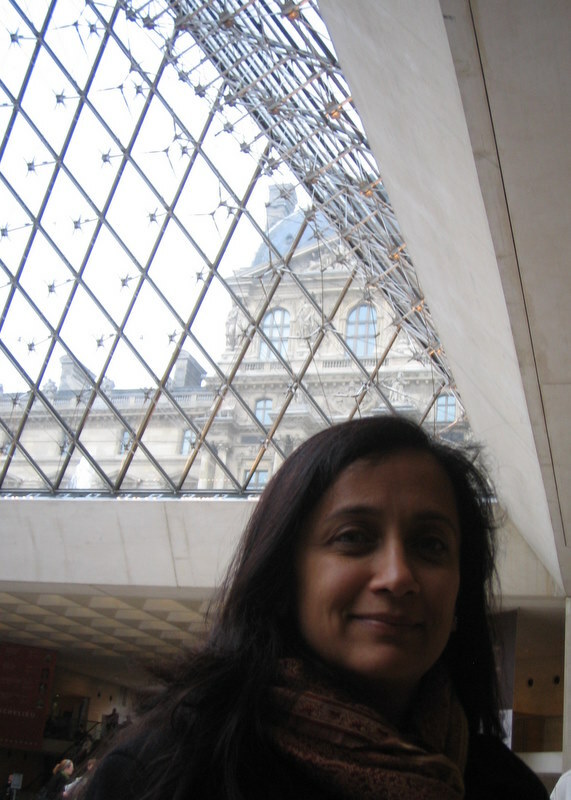 We took it pretty easy and just visited the Louvre and walked around the Eiffel Tower. 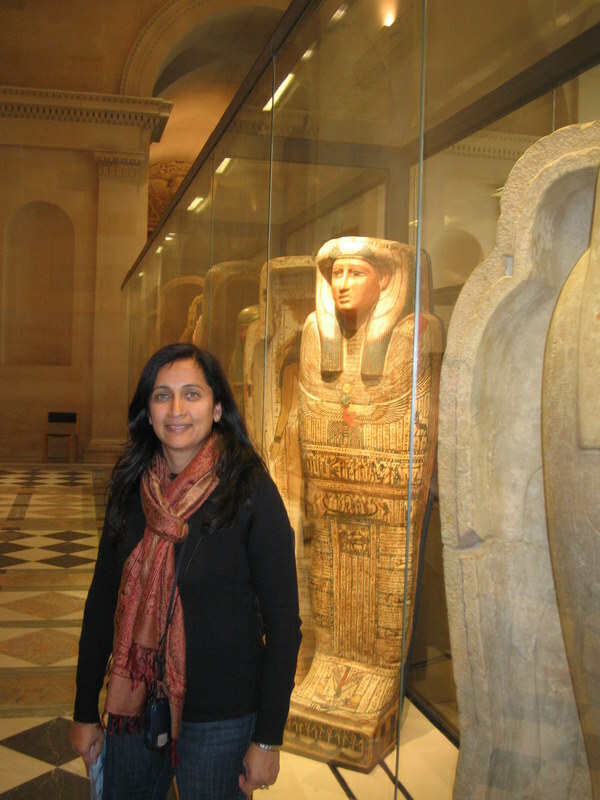 Here are a few picture from the Louvre. 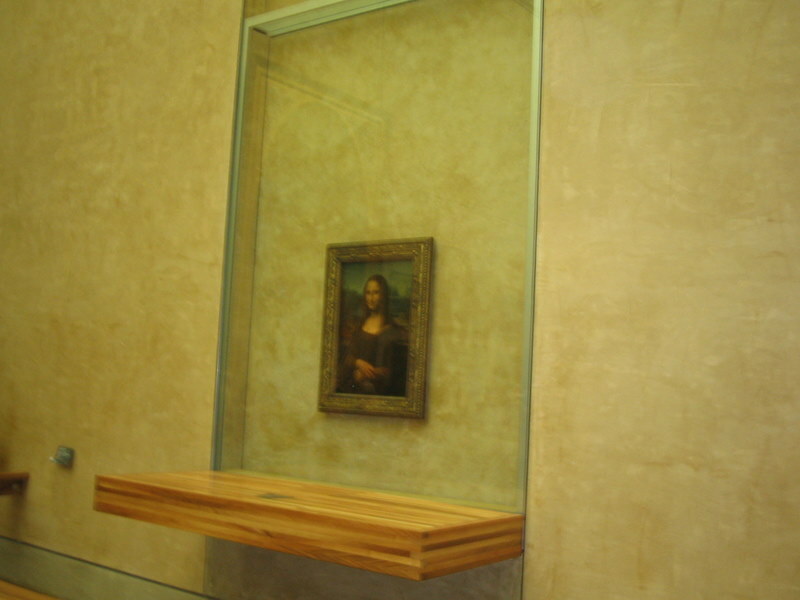 We did see the Mona Lisa but boy was it unimpressive! They make you stand 20 feet away from the painting. It is covered in 2 layers of plexiglass and is at most 2 ft by 2 ft. Not sure what the big deal is. Anyway – see for yourself! 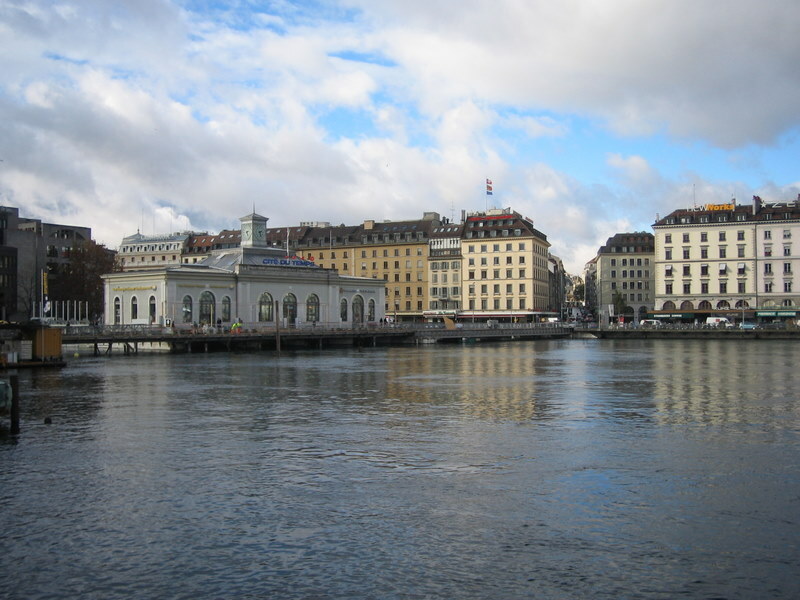 After a nice lunch at the Dome Cafe near the Eiffel Tower, we headed back to Geneva which was a 4 1/2 hour drive. 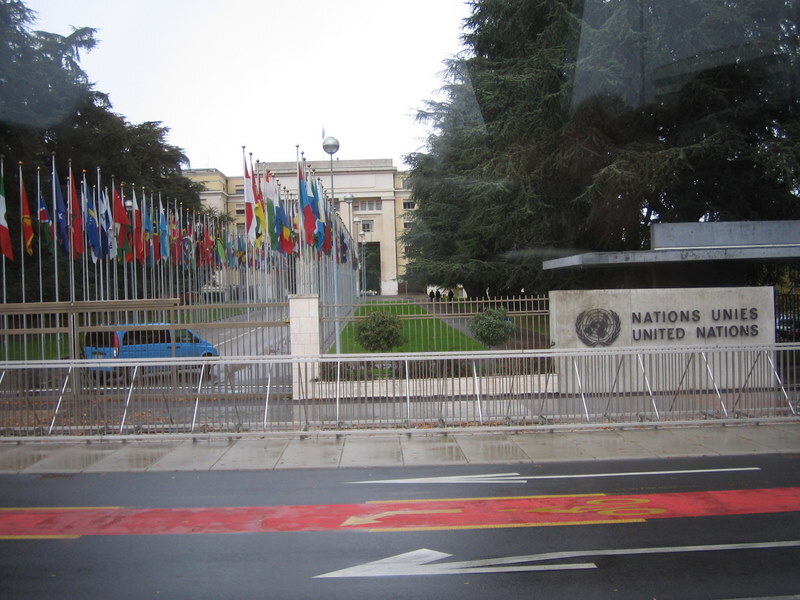 I must also mention that without our TomTom GPS system we would have been hopelessly lost in Paris. Maybe not such a bad thing. We hope to get back again in a few years, though there are too many other sights to see on our list of 50! The Paris bus and train strike that started last week almost derailed (pun intended) our plans to visit Paris over the weekend. We ended up cancelling our train tickets and instead drove the 525km trip from Geneva to Paris. 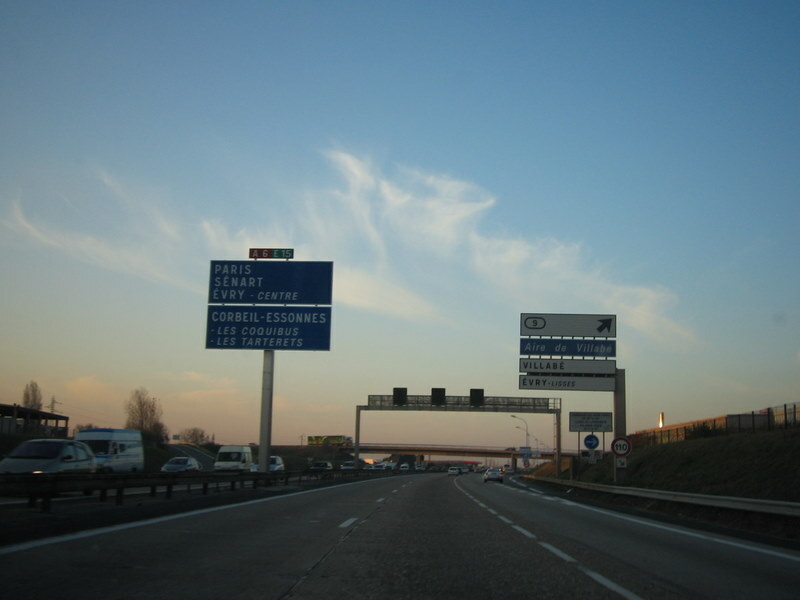 The drive itself was fairly easy with the TomTom GPS system and the outstanding toll roads in France. We were able to do all of the touristy things including a visit to the Eiffel Tower, Orsay Museum, Notre Dame, Champs Elysses and The Louvre. Here are a few pictures with more to come later. This is a picture of the toll road on the way into Paris on Friday afternoon. No traffic until the last 20 km and consistent speeds between 130kph and 160kph. 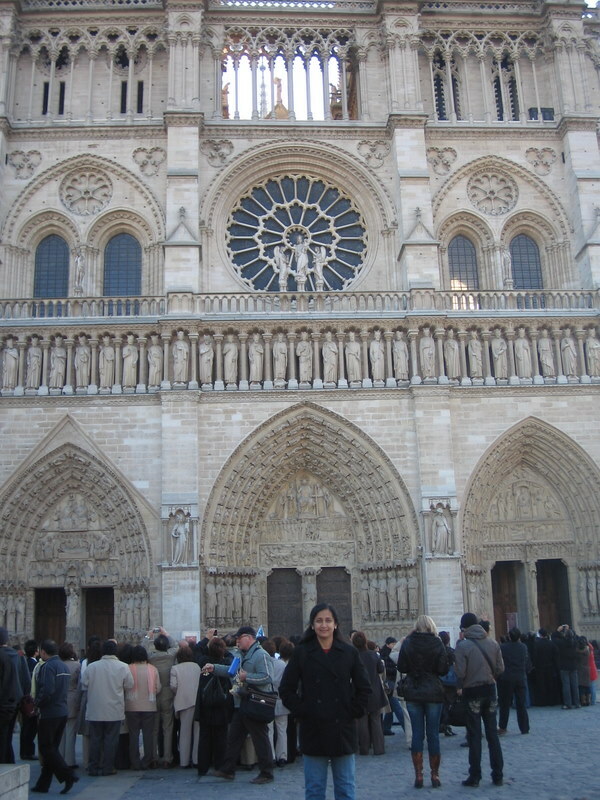 On Saturday, we started off at Notre Dame Cathedral. 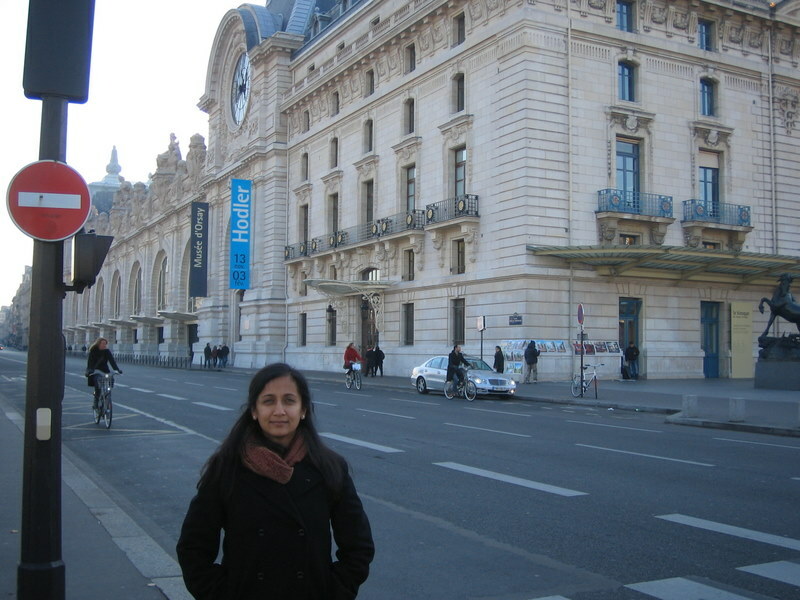 We then went to the Orsay Museum. Featured were paintings from Degas, Cezanne, van Gogh, Toulouse-Lautrec, Monet, Manet, Degas and numerous other famous works of art. We spent the the rest of the afternoon on the Champs Elysees. 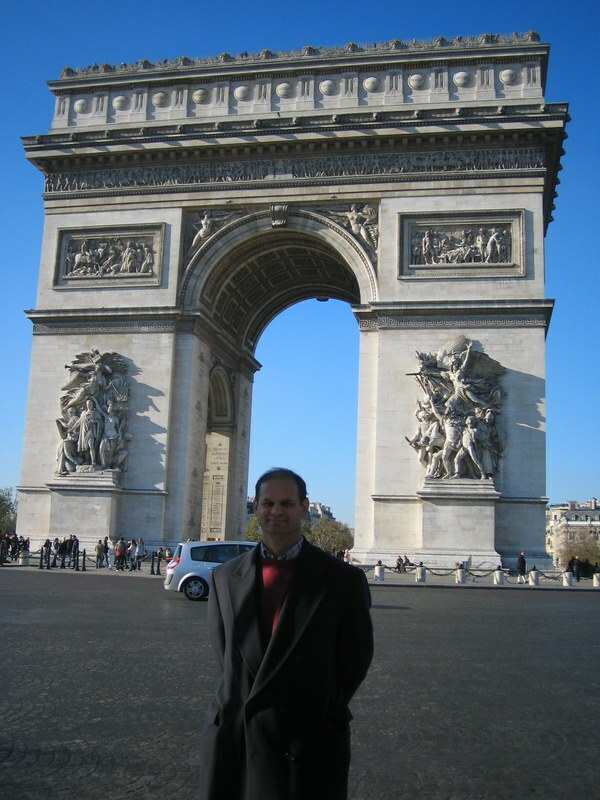 As we were standing at the Arc de Triumph pictured below, we saw a green Jag getting sideswiped by another car! We did some window shopping and some real shopping. More on that in another post! Late in the afternoon we visited Cafe Laduree on the Champs. This is the best 20 Euro cup of coffee and desert for two that money can buy. All kidding aside, the cafe is outstanding and I would highly recommend taking a tea break at Laduree after a full day of sightseeing and shopping. Make sure to sit upstairs and look out over the Champs as you enjoy your outstanding cafe au lait and savor the fabulous desserts! 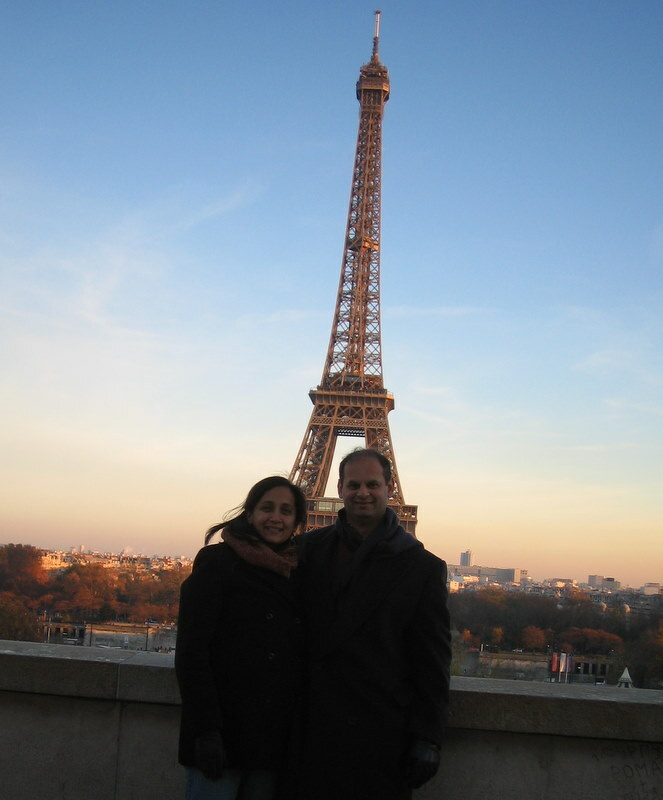 Finally, we went to the Eiffel Tower on Saturday evening and watched the sun set as the lights illuminated the tower. The tower is even more impressive in person than any pictures can do justice to. 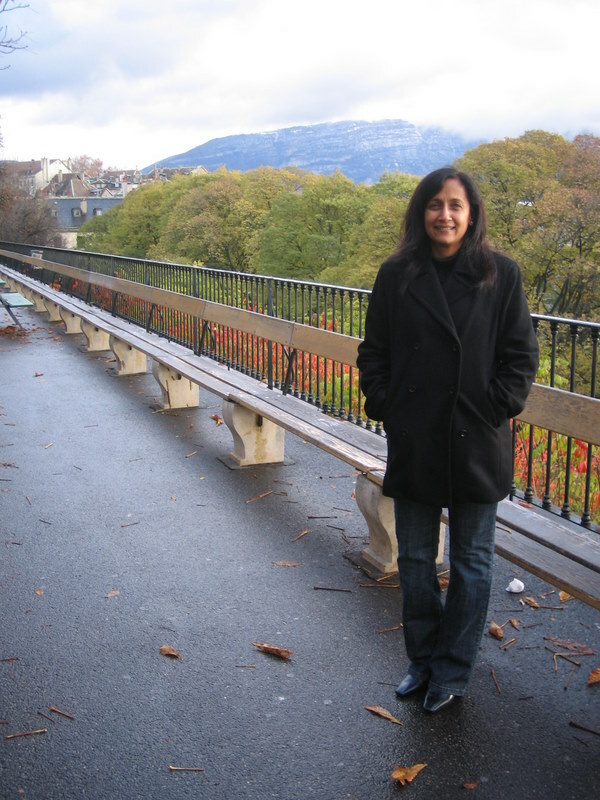 Anjali is on her way home today…… I return in a few more days after finishing up some more meetings here in Geneva. I’ll post some more pictures tomorrow. Au revoir! As I was searching the internet for articles on our upcoming trip(s) (more to come on that), I came across this fun article originally published by the BBC. It lists their top 50 places to visit before you die. Interestingly enough, not a single item is in the UK! I am up to 13 with just 37 to go. How many do you have?